My beautiful companions in Farrera, Spain at the Centre d’Art i Natura. 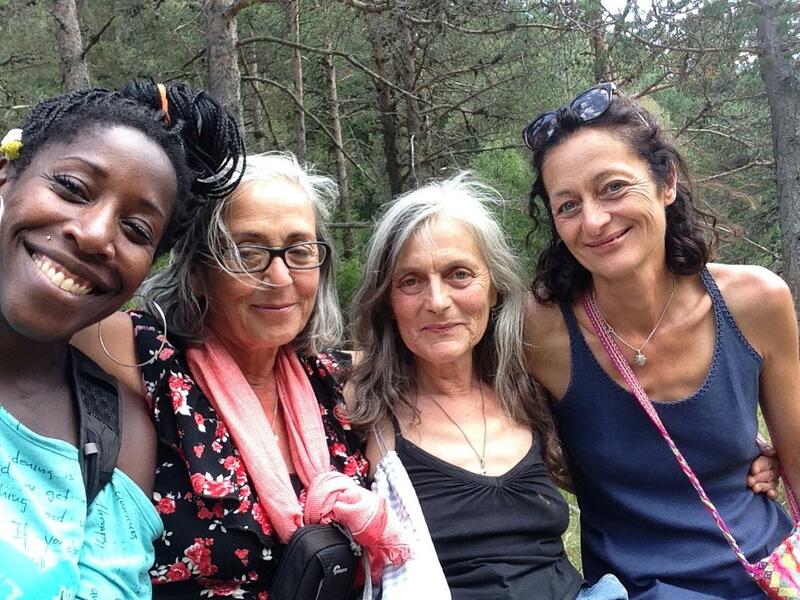 From left to right: Me, Cesca (artist), Ana (herbalist), Eulalia (artist). These are the kinds of angels you meet when you follow your heart where it leads. Learn how you can join me in Paris, France for Bonjour, Paris! Follow Your Heart and Map Your Dreams for 8 or 16 days. This is a group retreat that will help you open your heart, uncover your desires and make plans to manifest your dream in the new year. Learn how you can join me in Farrera, Spain for Healing and Transformation Retreat in Farrera, Spain. This group retreat will use the beautiful landscapes of the Catalan Pyrenees to support your healing and transformation while letting you enjoy the magic of beautiful Barcelona. Learn about booking a Personal Healing and Travel Retreat with me. You can come to my location or we can arrange to meet somewhere else in the world. My travel calendar is listed on that page to help you vision your adventure. You want to experience the world through the eyes of your heart. You want to quiet your mind. You want to develop and nurture self-love and self-acceptance. You want to have a deep and meaningful travel experience. You want to have a fun and exciting adventure that’s balanced with wisdom. You want an awesome and trustworthy travel partner. Group retreats are a great way to meet new friends and join a community of women who lead a spiritcentric life. The community lends support during during the transformation process and we all learn from one another while we travel and work together. Personal retreats are a wonderful way to say, “I love you,” to yourself. They are a powerful act of love. I structure them to meet your needs and temperament. Together, we get very clear about your needs and desires and then I take the information and create a travel and transformation itinerary that inspires and excites you. While traveling together, I will be your earthly spirit guide and your tour guide. These trips are FUN and powerful for transformation. If you want to talk to me about traveling with me, please feel free to book a complimentary Discovery Session. This will give us an opportunity to get to know one another and to help us vision a path of travel and healing for you.